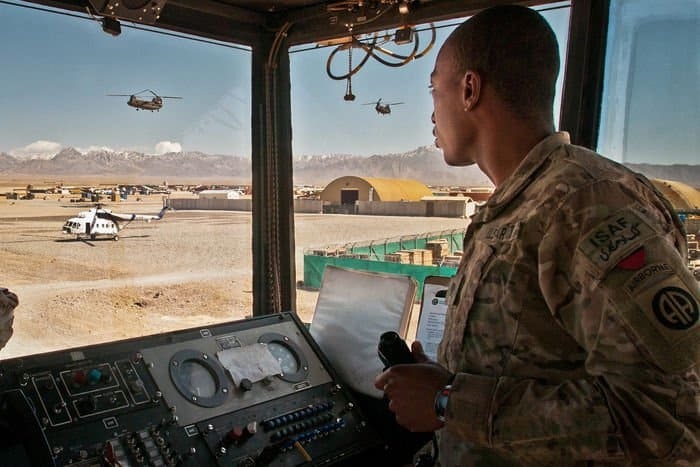 LOGAR PROVINCE, Afghanistan – Google “most stressful job” and air traffic controller invariably pops up near the top of the list. Being responsible for the movements of large aircraft full of human beings onto and off of runways and around each other in the sky can put a lot of pressure on a person. 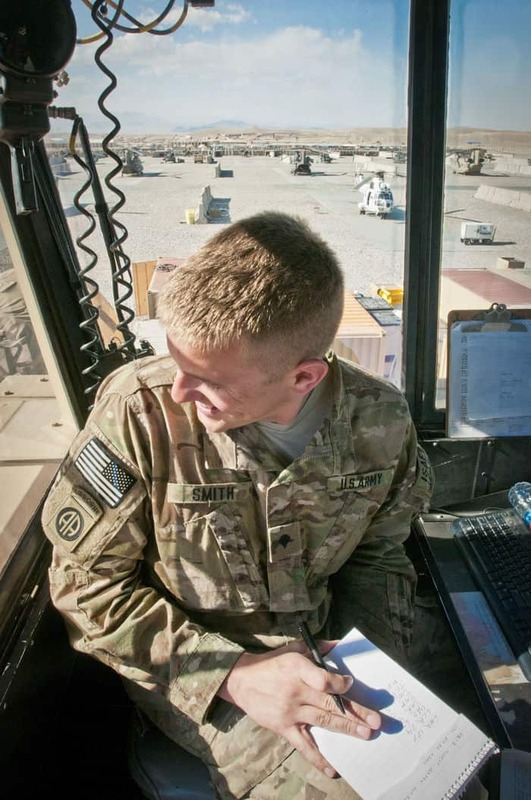 There’s another high-stress job that consistently tracks even higher on that list – Soldier. LOGAR PROVINCE, Afghanistan U.S. Army Specialists David Hamilton, Quentin Bradford, and Spencer Smith, all air traffic control specialists for 3rd Battalion, 82nd Combat Aviation Brigade, Task Force Corsair, conduct aircraft movement on their flight line on Forward Operating Base Shank. The air traffic control specialists of 3rd Battalion, 82nd Combat Aviation Brigade, Task Force Corsair stationed at Forward Operating Base Shank do both. 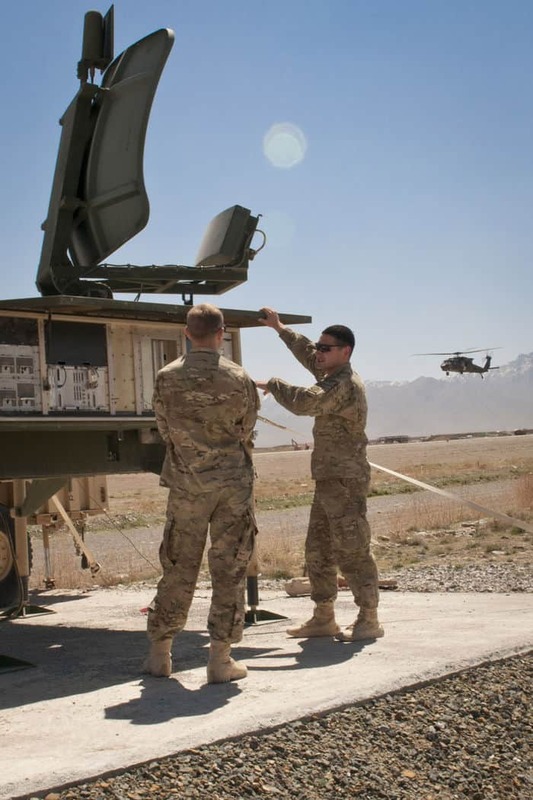 The ATC’s at FOB Shank, the only Army-controlled air field in Afghanistan, execute the same tasks as their civilian counterparts do back in the States – except without as much advanced technology and in the middle of one of the most kinetic war zones of Operation Enduring Freedom. It’s kind of a big deal. LOGAR PROVINCE, Afghanistan U.S. Army Spc. Quentin Bradford, from North Chicago, Ill., an air traffic control specialist for 3rd Battalion, 82nd Combat Aviation Brigade, Task Force Corsair, guides two CH-47 Chinooks as they descend onto his flight line on Forward Operating Base Shank. The U.S. could not control the country’s air space with absolute authority like it does without them. They work in shifts of three from the control tower on the main base and a ground control point next to the landing strip, scanning the skies and memorizing flight routes 24 hours a day, 365 days a year. With eleven landing surfaces that accommodate both rotary and fixed-wing aircraft, the FOB Shank air field can get hectic, fast. LOGAR PROVINCE, Afghanistan U.S. Army Spc. Spencer Smith, from Monument, Colo., an air traffic control specialist for 3rd Battalion, 82nd Combat Aviation Brigade, Task Force Corsair, watches his flight line on Forward Operating Base Shank. The control room itself is a modular unit with large windows on all sides, placed atop a stack of shipping containers to give the ATC’s the best possible view. 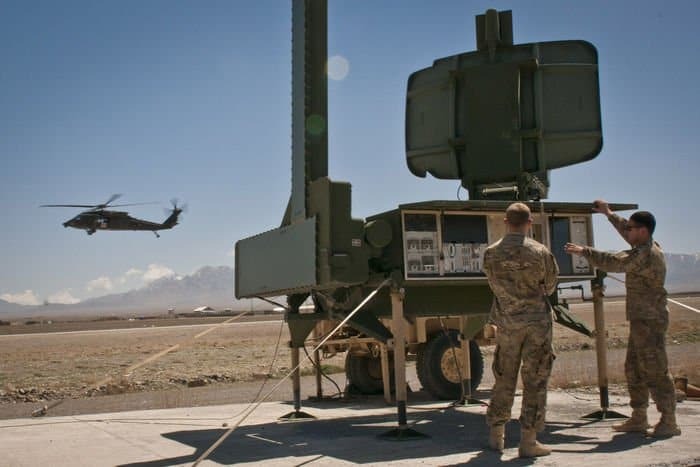 It’s about the size of a coffee cart, and with three Soldiers inside scanning sectors, radioing pilots, and jotting down notes, it gets as noisy and bustling as it would behind the counter of your busiest neighbourhood Starbucks. LOGAR PROVINCE, Afghanistan U.S. Army Specialists Luke Perkinson, who is from College Station, Texas, and Peter Meppen, from Nassau, N.Y., both air traffic control specialists with 3rd Battalion, 82nd Combat Aviation Brigade, Task Force Corsair, check out the sensor pallet for the Forward Operating Base Shank air field as a UH-60 Black Hawk executes a low approach. “You can get really nervous because you’re dealing with 15 to 20 people’s lives at a time,” said Hamilton. 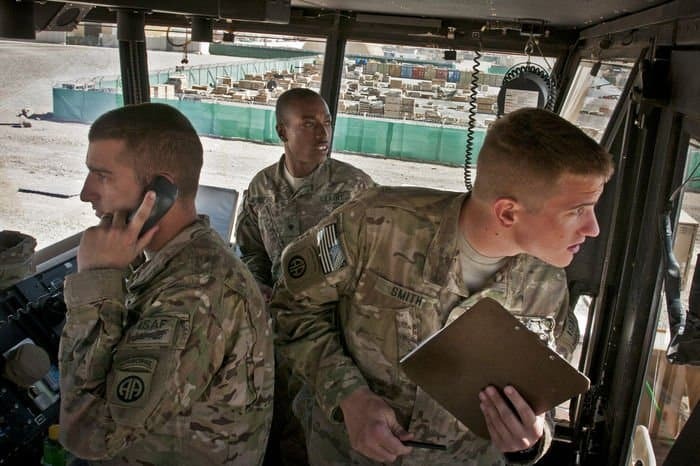 People with even moderate knowledge of how the U.S. Army operates might be surprised to learn that its local ATC’s keep track of all the aircraft within their airspace in their heads, without the aid of computers or radar – except in inclement weather – which would seem to go against the U.S. military’s normal methods of operation. One reason for this is the stringent standards prospective controllers must meet to pass their courses at the ATC advanced individual training school at Fort Rucker, Alabama. It’s also in the crosshairs, with kinetic activity just outside the wire and frequent medical evacuation flights, making it necessary to divert air traffic through different sectors at a moments notice. 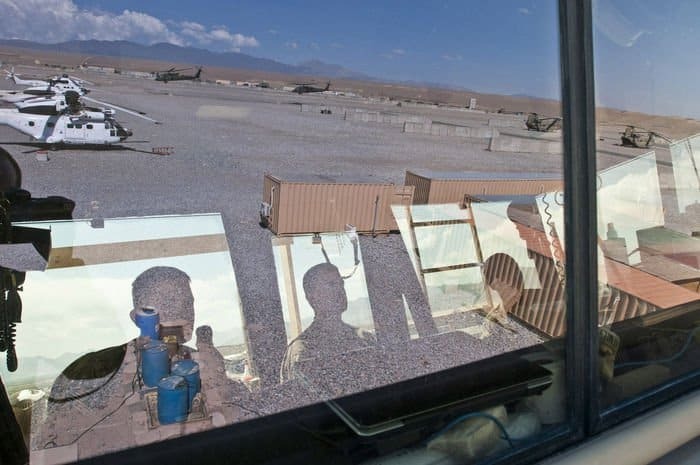 LOGAR PROVINCE, Afghanistan The flight line is reflected in the windows of the air traffic control tower on Forward Operating Base Shank as U.S. Army Specialists David Hamilton, Quentin Bradford, and Spencer Smith, all ATC specialists for 3rd Battalion, 82nd Combat Aviation Brigade, Task Force Corsair, guide two UH-60 Black Hawks. When things do get exciting in the sandy hill country just outside the wire, the ATC’s have the best view in the house of all the action, and often relay what they can see to aid the troops in the field. “You can watch it all from up here,” said Hamilton. And do they ever worry that they might provide a tempting target, working as they do in a tower that sticks out like a sore thumb in the middle of the FOB?